The oldest known set of soccer rules were auctioned today at Sotheby's of London for 881,250 pounds ($1.4 million). Bidding was much lighter than anticipated, with only two parties bidding on the historic item. An anonymous bidder purchased the rules. Money from the sale will be used to help with the development and upkeep of the word's oldest football club, Sheffield FC, which was founded in 1857. The team was the original owners of the rules that were established by the soccer club in 1859. 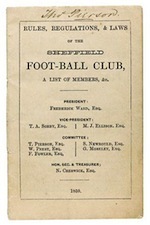 The auction lot included the original hand-written draft that was composed in 1858 as well as the only surviving print copy of "Rules, Regulations, & Laws of the Sheffield Foot-Ball Club." Interest and expected bid amounts for the piece of soccer history increased significantly leading up the sale. Some experts even thought the auction could topple the $4.3 million paid last year for the original rules of basketball. Investors from Qatar were expected to make a strong push for the rules to showcase them at their upcoming stint as World Cup host in 2022. 2011 Upper Deck MLS Soccer Hobby Box. Brand new sealed.